Gatekeeper is a new security feature in Mountain Lion, Apple's latest operating system. It basically prevents you from installing applications from developers not "identified" by Apple. In it's default state, Gatekeeper will only allow apps from the Mac App Store or developers that have signed up with Apple to be installed. For the most part, I think this is a good thing. However, sometimes you do want to install software that Gatekeeper is blocking. 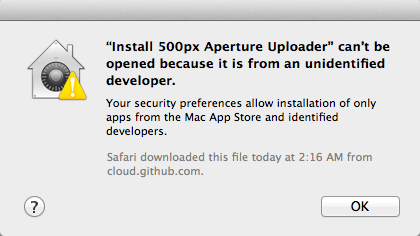 For example, I recently installed Apple Aperture on a Mac and one of the plugins I use to export to 500px was blocked. I got the following message saying "Install 500px Aperture Uploader can't be opened because it is from an unidentified developer". To bypass this, you can disable Gatekeeper from System Preferences - Security & Privacy - General. But you'll need to remember to change it back afterwards. 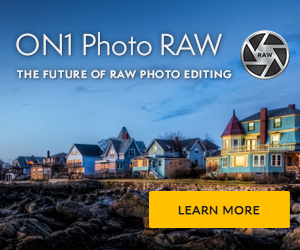 An easier way is to just right-click on the installer and choose Open. You'll get the same warning dialog but with an option to Open. Clicking this will bypass Gatekeeper this one time and allow you to install the app without having to change settings.